A little more done on the Telecaster necks. I've got all 9 necks routed for resin reinforced fabric beams, about 1/2" X 1/2". This first one will be Carbon fiber. I think that the others will be straight fiberglass, as I already have plenty of strand prepared from another job. Step one is to prepare the work area. The mixed resin is spread over the fabric, which is then squeegeed of excess resin. The idea is to have enough resin to coat all the individual strands, but not have them drowning in it! Its the Carbon fiber that will provide the beam strength, not the resin. 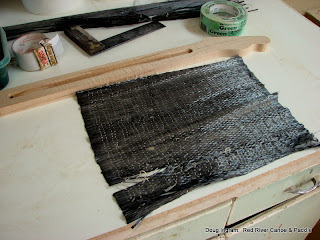 The fabric is folded or rolled up, and excess resin is squeezed out. The roll is placed into the routed groove, and pressed into place so that the strands are really packed it. 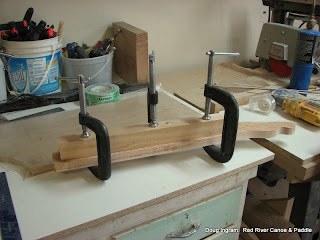 A piece of wood is clamped over top to held it all as flat as possible. The wood has packing tape on it to act as a mold release. ...and this is the result. 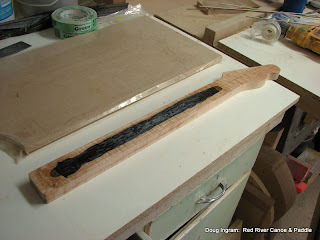 The neck is ready to receive the fingerboard now. 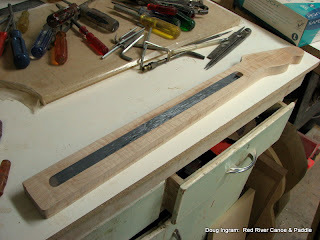 Once that is one, then final shaping and fret work is left. Posted by Doug Ingram at 9:53 p.m.